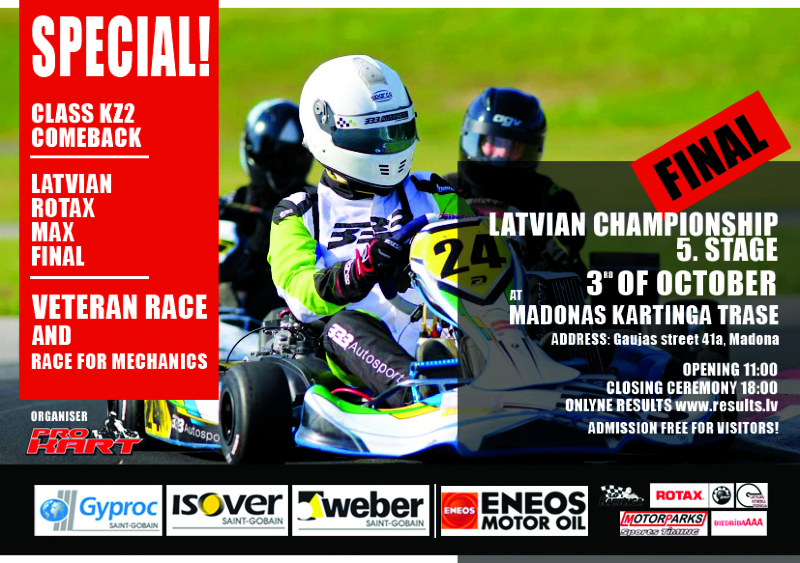 This weekend ends the Latvian karting season. The fifth round of the Latvian championship will take place in Madona. In the race day Agenda Rotax Challenge Cup Final, KZ2 class return to Championships, race fore karting veterans and mechanics. Important information for potential participants. Since this is the final race and relatively the open days for Latvian Championship, then this time have the opportunity to use a variations on the rules, and practically any lower league driver can try their hand in Latvian Championship. 2) Rotax engine must comply with the technical regulations, but the seal is not mandatory, engines will be controlled any way. 3) Participants for Latvian championship do not need to buy tires at the Race office, they can use his own tyres. Only for Rotax Challenge Cup participants tires must be purchased at the race office. 4) Participants equipments - homologation are missing - this time it will not be strictly controlled, the final decision on the equipment admission concerning the specifics of the competition will adopt the technical commissioner. If there are some questions please call or write to the race organizer (+ 371-29532998). Applying for the competition on the internet will continue until Thursday evening. This time, first registration on the race day, will not special charge. Please review the competition binding document and see You on the racetrack.